PETALING JAYA: The number of condominiums mushrooming within Mont’ Kiara and KLCC may have caused the suppression of market rental yield (net), but this does not necessary indicate bad news from many investors’ point of view, says executive director of Regroup Associates, Paul Khong. “Firstly, investors who purchase the KLCC and Mont’ Kiara condos are more driven towards capital appreciation rather than looking at the fundamental of rental yields; same theory for people who prefer to buy landed properties,” he adds. Secondly, condo prices have dropped around 10% to 20% and 20 to 30% among luxurious condos within Mont’ Kiara and KLCC respectively as compared to its peak between the second and third quarter in 2008,” says Khong, while noting less price drop of around 10% among condos located in other areas such as Petaling Jaya (PJ). Sarkunan Subramaniam, executive director of Knight Frank Malaysia concurs: “The rental yield performance will not affect much on the buying mood among investors who are keen to buy condos located at both KLCC and Mont’ Kiara areas as majority of them purchase in anticipation for bigger gains in future capital appreciation”. Regroup’s Khong also says that the slight market rally which started around 3 months ago has seen property prices moving up slowly with less fire sales and availability of good buys as compared to the first quarter of 2009. “A lot of condos are now trading close to developers’ prices and if you could get a 30 to 40% discount on the purchase price, there is a good chance of capital appreciation. “It all boils down to your entry price versus the transacted price - if your entry price is high, chances are the capital appreciation will be limited,” Khong notes. Knight Frank’s Sarkunan adds: “Personally, I think we have reached the bottom somewhere around the second quarter of 2009, and I believe it is the right time to scout around for good buys especially in October and November before prices start picking up at a faster rate. The prices for the KLCC condos have easily dripped around 30% to 40% since late 2008. Today, condo prices are correcting to a reasonable level. If you are buying 30% to 40% below the peak market price, it is considered a good buy,” says Sarkunan. Based on Regroup’s research, Khong says the Mont’ Kiara/Sri Hartamas and KLCC areas currently contribute around 50% of the total number of luxurious condominiums (RM350 psf and above) in Klang Valley. Besides that, he says Regroup’s statistics also show that in the next few years, new condos smacked in Mont’ Kiara/Sri Hartamas and KLCC areas will consist 57% out of total new luxurious condos supply in Klang Valley with 26% and 31% contributed by Mont' Kiara/Sri Hartamas and KLCC respectively. “The current supply for luxurious condos totals 7,500 units within Mont’ Kiara and Sri Hartamas, and future supply amounts to 5,800 condos,” says Khong. In KLCC, Khong says the current supply of luxurious apartments and condos with RM350 psf and above collectively amounts to about 5,700 units while another 5,000 units provided by 18 projects are expected to pour into the market in the next 2 to 3 years. In terms of rental yield, where its performance for every condo differs, Sarkunan reveals that data from his research suggests condos yield in Klang Valley has generally increased marginally at about 1% higher now as compared to September 2008. “In good times, yield may be lower as the anticipation of capital appreciation is higher- i.e. many investors are willing to bear with lower rental and yield as they expect high capital appreciation in future. But this situation has somehow reversed as the economy is not as good as compared to those booming days, therefore, we are seeing a marginally higher yield now,” Sarkunan says. Sarkunan cites condos located in Bangsar currently generates yield at around 4.5% per annum, where as the sub-urban areas such as Cheras, Petaling Jaya (PJ) and Subang are currently generating yield of 5% to 7% per annum. Meanwhile, in KLCC, condo rents started to decline around 30% since late last year, while its rental yield stands at about 4% per annum, says Sarkunan. On the other hand, Khong says the current yield for Mont’ Kiara is around 3% to 5% per annum and there are cases where existing tenants have moved out from the older condos to newer ones in Mont’ Kiara, for the same rental. Khong also notes that substantial supply of condos within an area will eventually cause a lower rental due to stiff competition in the surrounding areas. “Although some landlords of condos in prime areas have reluctantly slashed their asking rents by 50%, they are still unable to find any tenant. This tactic to attract tenants caused a lower yield in the rental market within that specific area,” says Khong. Kuala Lumpur residents were generally happy to hear of the proposed LRT lines that will run through their neighbourhood. Residents living in Bukit OUG condominium and Bukit OUG Townhouse in Jalan Kelang Lama were delighted that there would a station close by their neighbourhood since buses do not ply there. Student Carol Lee, who lives in Bukit OUG, said she was happy to hear the news as she often had to rely on friends to drop her off at the main road. “Once I am at the main road, I have to get a taxi to go to KL. This (LRT lines) is definitely good news,’’ she said. Kinrara resident A. Siva said life would be easier for his family. “My wife takes the bus to work every day. With the LRT, it will be easier for her,’’ he said. But not everyone is rejoicing. The residents of Taman Esplanad in Bukit Jalil are unhappy with the proposed Ampang line that is running paralel to their homes. Esplanad Residents Association vice-chairman Jason Lim said the proposed lines were too close to their houses and that residents were worried about the noise, dust and vibrations that would affect the quality of their lives,’’ Lim said. According to Lim, the LRT alignments is located a mere 15 metres from houses in Jalan 19/155B and he considered it too close. “We had meetings with people from Prasarana about this and had suggested that they move the lines closer to the Kesas Highway which is 97 metres away from the houses,’’ he said. The residents had organised two peaceful protests early in the year when they heard about the project. 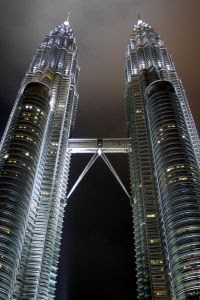 The proposed lines were highlighted in the Draft Kuala Lumpur City Plan (DKLCP2020) and residents had already made their objections to the Kuala Lumpur City Hall (DBKL). But what irked them most was that contractors had already started carrying out soil investigations at the site months before the plan was mooted. “This shows that they are not sincere about hearing us out and everything was just a show,’’ he said. When contacted Seputeh MP Teresa Kok said she wecomed the new lines as it would reduce congestion in the area. Teresa, who is also Kinrara assemblyman, said Prasarana had tried their best to come up with an alignment that suited everyone. “They did their best considering the limitations they had to work on,’’ she said. On Monday, transport company Syarikat Prasarana Negara Bhd group managing director Datuk Idrose Mohamed said the proposed extension were the most cost effective and well-thought out alignments that would serve the needs of the community. Idrose said the company had to balance the needs of the majority residents in a particular area. The Ampang LRT extension would cover 17.7km, and start from the Sri Petaling Station, passing through areas like Bukit OUG, the Bukit Jalil Golf and Country Club, and into Puchong, IOI Mall and Tesco before ending at Putra Heights. It will have 13 new stations. The Kelana Jaya LRT extension starts from the Kelana Jaya station, passing through Subang Jaya and USJ, Carrefour Subang, Subang Ria Recreational Park, SS14, USJ2, USJ8, USJ19 and Hicom Induatrial Estate.It covers 17km with 13 stations. The line will also have five stations with park-and-ride facilities. The stations will be equipped with lifts, escalators, public telephones, surau, and toilets. It will also be disabled-friendly with ramps, lifts, low ticket counters and special toilets. The 35km of lines, which are estimated to cost RM7bil, will be elevated and are expected to be ready by 2012. Many people in the Klang Valley feel that the proposed LRT extension lines was long overdue. Good news: Husaini says that the LRT extension into Lembah Subang would make it easier for people to get to Kuala Lumpur. Lembah Subang resident Husaini Tumiran, 39, who stays near the LRT depot said his family had been waiting for the extension of the LRT lines. Husaini was among the people who showed up at the Menara MBPJ in Jalan Tengah to view the details of the plan that was put on display for public comments and suggestions. “I work near my house so it doesn’t make much of a difference for me but it will definitely make it so much easier for us to go to Kuala Lumpur. “We usually have to take a bus to the Kelana Jaya LRT station and that alone takes us at least a half hour,” said Husaini. He was also hoping that having an LRT station in the area would ease the traffic congestion in the morning. “The traffic is bad during peak hours near the tunnels (referring to the FAS and Taman Megah Mas tunnels) heading to Petaling Jaya,” said Husaini. Chew Ah Peck, who stays in USJ 15, and works in Section 52 in Petaling Jaya, usually drives to work. “I sometimes leave my house at 6am just to avoid the jam. I will definitely take the LRT because I will be saving on parking and petrol,” said Chew. Chew said there should be a multi-level parking at every station to encourage more people to use the LRT. Chew’s colleague Chloe Peh, who stays in USJ 16, said the jam along Jalan Kewajipan was very bad in the mornings and she would rather take the LRT if there was a station near her house. However, Chew commented that the efficiency of the LRT services could be improved. “I used to take the LRT and there would be service disruption about once a month. “When the train breaks down in the morning, commuters get stranded and the area becomes chaotic as people try to get a bus or taxi to work,” said Chew. She also commented that the extension lines would not through some high density areas like Bandar Sunway, which would help alleviate the congestion. Puchong MCA division chairman Wong Hock Aun and secretary Liew Yew Fook were among the eager residents to view the plan for the LRT extension at the Subang Jaya Municipal Council (MPSJ) in USJ 5. Our views: Wong (right) and Liew writing down their comments on the logbooks. Wong commented that the extension should be completed as soon as possible to benefit the people. However, he felt that in addition to the 10 stations in Puchong, there should be stops in Taman Kinrara Section 3 and Batu 14 to cater for the residents there. He added that the stations, especially those along the Damansara-Puchong Expressway (LDP), should be carefully planned to avoid causing traffic congestion. “The park-and-ride station at IOI Mall, which is now tentatively located in front of the mall, should be relocated to the area behind the mall since there is space,” he said. The feeder bus service, too, must be well implemented to encourage the people to use the LRT and cut down on the use of cars. MPSJ councillor Robert Tan, who pointed out that the line does not go into Bandar Sunway, suggested that Prasarana extend the line, or add a loop, in the high-density area. “The main objective of having the LRT is to serve the public and relieve traffic congestion. If there is a stop at Bandar Sunway, shoppers do not need to drive to Sunway Pyramid,” he said. USJ 11 resident Lily Chang welcomes the extension plan as an alternative to the KTM, which she used to get into the city centre. “The KTM is always late and there is only one station in Subang Jaya, which is near Carrefour. Hopefully with the LRT stations in USJ, the jam would be reduced and probably the pollution, too,” the 42-year-old real estate agent said. According to the Prasarana officers on duty, there would be two officers on hand daily to assist the public to understand the plans. 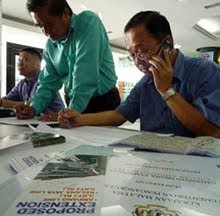 Logbooks and a computer are available for the public to convey their suggestions, enquiries or complaints to Prasarana.